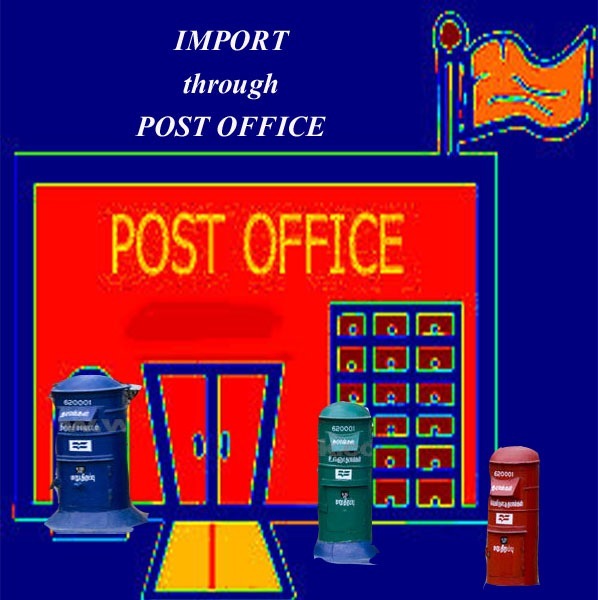 What is the Procedure for importing goods through Post offices in India. There are many queries to me asking about import via post office, whether import and export through post office is allowed? What are the formalities of import through post? How import duty is calculated if sending through post office? How to assess the value of goods under import through post office? How to inspect parcels under import through posts? How does customs officials involve in import through post etc. etc. In India, import through post is permitted subjected to prohibition or restrictions. Such shipment through post should be routed via foreign post offices. 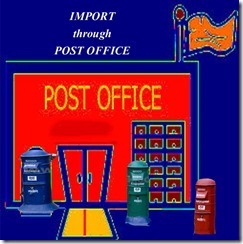 As regular shipments, import through post also carries way bill mentioning with details of parcel. Customs officials are deputed to handle such imports through post offices. After necessary examination of goods by the authorities, if no contraband is found, the parcel can be delivered to addressee, if no duty is attracted against such goods. If any dutiable items imported through post, customs officials indicates the amount of duty to be paid. Such duty is collected from the addressee before delivering parcel to them after collecting postal service charges if any. If customs officials require any supporting documents on import clearance, addressee is called up on for such documents and after necessary satisfaction on assessment and inspection, the parcels are cleared. How does the time of levying duty on parcels imported by post? The date of determining the duty on goods imported by post is the date on which the postal authorities present to the concerned officer of customs. This is the date on when the postal authorities present the details of list of parcels to the proper office of customs for assessing the value of goods and inspection. If such goods arrived by vessel or flight through post office and the list of goods is presented before the date of arrival of goods to the customs authorities by the postal department authorities, the rate of duty will be taken in to account on the date of arrival of vessel (ship) and not before. I hope, I could satisfy you on the procedures and formalities on import through post offices in India. Do you have different thought on import of goods via post office? Write below your comments. DHANUSH RAMAKRISHNAN: On 05 February 2014 I got an import license from DGFT in India. I have IEC (Importer Exporter Code). I want to buy lot of items from eBay.com. Most of the eBay sellers are from China and Hong Kong. I am a reseller in India. So what is the procedure. I am ready to pay import duties. What documents eBay seller has to provide along with parcel? If seller in eBay forgot to attach documents what can I do? And what documents I need to submit to customs? How can I submit? I have only IEC code. All packages are coming through India Post registered and my packages are not very big. Please send reply as soon as possible. Alex: On 12 November 2014 You can use mail forwarding services. Such as Comgateway, singapore post. You can use their PO box services to import from Foreign countries. Is this is worth?? Komel: On 19 February 2015 I want to import crude coconut oil will I be eligible to import duty free like palm stearin. Siji mol: On 11 March 2015 I am really blessed with your sight and valuable article. Complicated things are changed to simplified version by you, thank you for it. I am planning to start a logistic company in Saudi. Pls can you advise me how to do it . Parveen Bhatia : On 08 July 2015 I am planning to start my boutique of fashion jewellery, hand bags and women apparel for which I want to import goods from china. However I don't want to go through any agent and want to obtain IEC. Can you please help me in details about nearest custom clearance port from Jamshedpur (I think it's Kolkata), list of documents I need for custom clearance and what is the procedure after I place my first order? My order will involve multiple suppliers and each order might vary from 10,000 - 1 lac. Your help will be really valuable since I am totally confused about the custom clearance affair and rules. Vineet Madhwani : On 05 August 2016 First of all, your website is very helpful for new importers & I thank you from the bottom of my heart for doing such a service for people all across the country. I am a budding entrepreneur & want to start my business by importing goods from china. We have zeroed down on a supplier & would need your expertise on the following points. Which courier service is the best in terms of cost & delivery? Do we show it as "Meant for Personal Use" as it is a small order & first time? Do we need to pay custom duty on our item - Sunglasses ? Ritesh: On 12 August 2016 I show your website howtoexportimport.com and is very much impressed with it, we are trading company based in Ahmedabad and are interested to import goods from Malaysia and Middle East I would like to know that will you be interested in providing consultancy to us and what would be the charges for it. makesh raj : On 12 August 2016 I am Makeshraj from Salem, i want to know what are the procedure to start own import & export company in TN ,I mean rules to follow in licensing. can i get help from gov to know international trade procedures. vijay kapadiya: On 16 August 2016 I will start planning start export import office. i m from india and now start office in germany how to these procedure? Amjad Ansari : On 17 August 2016 I am interested for scrap Import licence from Nepal to India, Since I am based on the Nepal Boarder so its easy for me in communicating with Nepal as well, if you can provide detailed Information about import licence we are ready to pay your consultancy fee. Bhavesh Merchant : On 17 July 2017 We are Exporter since five to seven years, Now we have Imported goods from u.s for the first time of COSMETIC at HAZIRA (ADANI PORT, SURAT).As we were not aware about Form 43 , so cargo is stuck up in port since one month.This port does not have warehousing facility. Even Bill of Lading is not uploaded since begining.Now port authority has ordered us to Re - Export.In whole matter we are completely innocent , we are misguided by CHA.we have got your profile from Net .sir, we need your guidance for Re - Export procedure. Our CHA doesnot guide us properly. Even port officer says new things every day.Is it importnat to upload Bill of lading? Do we have to pay Duty as we are doing Re export.we will be oblidge for your kind help.Even when next time we will do this procedure of Import we will be approaching you. FATUM Team: On 17 July 2017 We have some queries about importing procedures which we want to share with you and would be grateful to you if you could provide us with the right information.We have got one lead from Korea, who deals in cosmetic products like face pack, body lotions, fairness products etc. We want to import their products in India. Their product is new in India and have never been introduced in our market before. We consulted with many regarding the importing process, but were never satisfied with the information. Some told us that we have to register their product while some told that we have to do the valuation of the product.We are very confused about what to do and how pursue in regard to this.